Become a Sustainer - $100/year. Use PayPal or a credit card to contribute. Where's Our Post Office Mural? Yikes, take a look at unequal income distribution in the United States. • Find out what you missed in the pages of past Beachheads. • Learn about the history of Venice. • Enjoy the prose and poetry of Carol Fondiller, John Haag, Rick Davidson, Jane Gordon, Milton Takai, Emily Winters, Steve Clare, Jim Zane, Wendy Reeves, Bob Wells, Joan Friedberg, Arnold Springer, Olga Palo, Moe Stavnezer, Kathy & Larry Sullivan, Elizabeth Elder, Rex Frankel, and hundreds more! Thanks to Chuck Bloomquist and Rex Frankel. 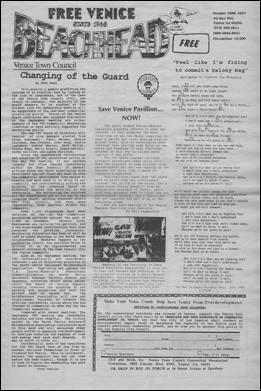 The Archives are independent from the Free Venice Beachhead and receive no funding from the newspaper.